I like C. L. Moore and Henry Kuttner so much that I’ve published 5 of their books so far in Paizo’s Planet Stories line, and will likely continue to do so for as long as the market will let me. Today’s volume, Earth’s Last Citadel, is one of their most notable collaborations. Pictured above is the 1964 Ace Books edition, which was followed in 1977 and 1983 with subsequent editions. The earliest I can trace the story back is a 1950 Fantastic Novels appearance, but as that magazine largely published reprints (and since it called the book “unrivaled among fantasy classics” on the cover), I’m certain the story appeared somewhere else first. The story is this: In the middle of World War II, a hero and his thick-accented Scottish buddy are trapped in an African desert with a hot Nazi femme fatale and her brutish assistant. Just as their final battle is about to occur, they discover a weird sort of space ship buried in the sand, which they investigate, finding a weird room of null light within. The unusual, extraterrestrial entity within the ship puts them into a sort of hibernation after which they emerge into a nightmare version of Earth in the deep, distant future, on the eve of its extinction. Mankind is long gone, giant worms crawl in bizarre jungles amid the ruins of unusual stone cityscapes. The four humans get involved in a series of adventures involving degenerate humanoids, the weird alien from the space ship (a creature composed of light and darkness that is described in extremely evocative language that must have come from C. L. Moore), and bits of ruined technology. Like many pulp era tales, the characters are fairly wooden and one-dimensional, but the action moves swiftly and there are touches of absolute brilliance that bring it above much of the work published in the era. If you’ve read Moore’s Northwest Smith and Jirel stories and enjoyed Kuttner’s The Dark World, this is your logical next step with these two fantastic authors. 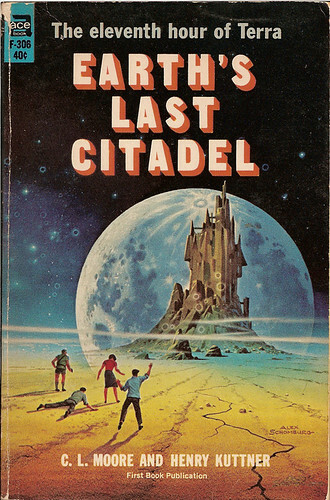 Earth’s Last Citadel will not disappoint.